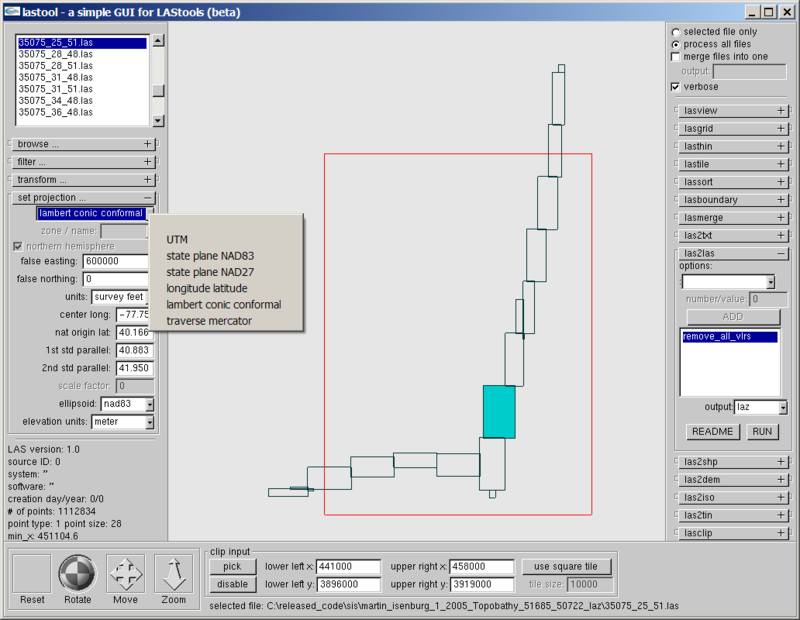 Built upon LASlib (with LASzip DLL) are LAStools - a collection of highly-efficient, scriptable tools with multi-core batching that process LAS, compressed LAZ, Terrasolid BIN, ESRI Shapefiles, and ASCII. The program lastile.exe creates a tiling of LAS/LAZ files, lassort.exe z-orders them, and lasclip.exe clips away points falling into polygonal shapes (e.g. building footprints). 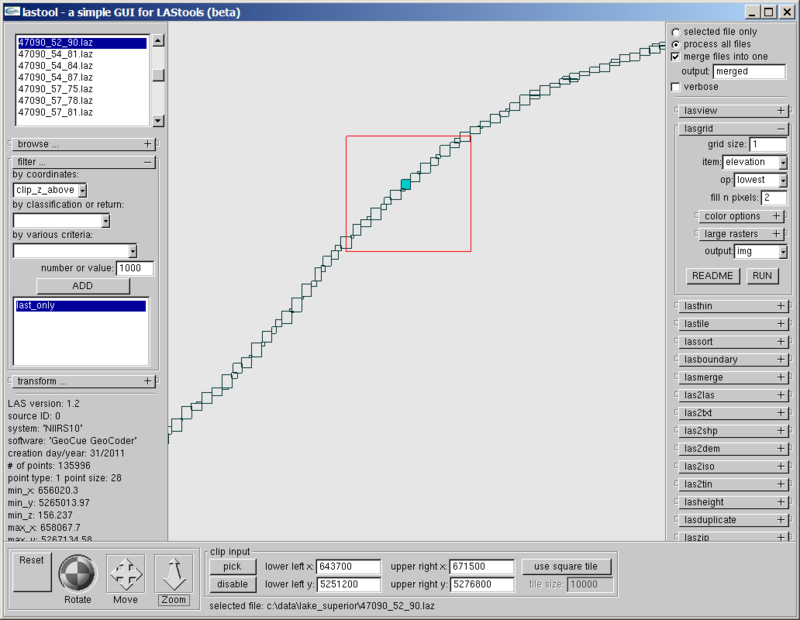 The tool txt2las.exe converts LiDAR from standard ASCII to LAS/LAZ. The corresponding las2txt.exe turns LAS/LAZ into human-readable and easy-to-parse text. The tool lasinfo.exe prints out an overview of the contents of a LAS/LAZ file, las2shp.exe turns LAS/LAZ into ESRI's Shapefile format, shp2las.exe turns an ESRI's Shapefile into LAS/LAZ, lasmerge.exe can merge several LAS/LAZ files into one, e572las.exe extracts the points from the E57 format and stores them as LAS/LAZ files, las2las.exe filters, transforms, subsamples, clips, thins, ..., lasthin.exe implements a simple point thinning algorithm, las2tin.exe triangulates the points of a LAS/LAZ file into a TIN, las2dem.exe rasterizes them into a DEM, las2iso.exe extracts, optionally simplified, elevation contours, and lasboundary.exe computes a boundary polygon (i.e. a concave or disjoint hull of the points). The little OpenGL viewer lasview.exe visualizes the contents of a LAS/LAZ file and can also compute a TIN. Our powerful, lossless LiDAR compressor laszip.exe turns large LAS files into much smaller LAZ files that are only 7 - 20 percent of the original file size. All LAStools read, process, and write the compressed format directly without having to first decompress the file. 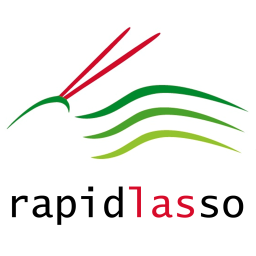 Our easy-to-use, ultra-light-weight, very efficient C++ programming API called LASlib (with LASzip DLL) (LGPL source code) makes it easy to add read/write support of compressed LAZ files to your software.